Most forms of paid advertising are publicly visible and easy to see. For example, if you’ve hired someone to put up a billboard for your business, you’d probably want to drive by every now and then to make sure it’s still there and in good condition. It makes just as much sense for clients of digital marketing agencies to want to see their ads whenever they search. However, search advertising is different from traditional advertising, and looking for your ads online isn’t a reliable way to check their status. Here, I’ll cover why you may not see your ads when you search, and how we are able to check if your ads are indeed appearing to users or not. Google paces your budget to spend throughout the day. Sometimes it runs out of budget early, but to avoid this, it doesn’t show your ad for every relevant search. When your ads aren’t appearing, competitors’ ads are, and vice-versa. It may show one in 3 searches, or one in 20 searches, depending on your budget. The higher your budget, the more it will show. If you used to see your ads when you searched and now you see them less or not at all, you may fit into this category. If you keep performing the same or similar searches, but not clicking on your ad, Google will show the ad less until it stops serving it to you altogether. What you’re telling Google with repeated searches without clicks, is that you’re uninterested in the ad. So it will show you others (perhaps competitors’) instead. In general, it can be detrimental to search for your ads, because if you are seeing them and not clicking on them it will inflate impressions, negatively affecting click-through-rate. Ideally, all the search data we get should be made up by potential customers, and not include searches performed by our clients and ourselves. This is why we sometimes exclude IP addresses. The other side of this is if you are searching for and clicking on your own ads. This not only skews data, but wastes budget as Google charges per click. Over time we accumulate data on days of the week and hours of the day that perform comparatively well or poorly. We increase bids during peak times, and decrease bids during slow times. Sometimes we set the ads to not show at all during extremely slow times so we can focus the budget on the more productive periods. So if we’ve found that your ads don’t perform well between 10 and 11pm on weeknights, and that’s when you happen to search, the ad will either be shown in a lower position or not at all. Regardless of ad scheduling, if you are searching later in the day you may have a lower chance of seeing your ads. Once Google has spent the set daily budget for a campaign, it tends to not show those ads again until the next day. There is some wiggle-room, but that’s generally the case. Search campaigns are configured to only target certain areas, whether that be by city, zip code, radius around a location, etc. If a search is performed from somewhere outside the geographic targeting, the searcher will not be served the ads. For example, you could see the ad when you search at home, but not when you search at the office, depending on how the targeting is set. Often times we block our own IP address which prevents our ads from showing for searches performed in our office. The purpose of this is so that our searches won’t affect the impression or click data for our clients’ accounts. We also sometimes block our clients’ IP addresses for the same reason. We do notify clients before doing this, but among all the emails during the account setup process it could be easy to forget! These all assume that you have active campaigns and are bidding on the keywords for which you are searching. If that’s the case and you’re still not seeing your ads, it’s likely due to one of these reasons. There are always exceptions to the rule though. Google is a mysterious beast and we’ll never know exactly how it chooses to whom it shows any particular ad. This is why performing a Google search is not a reliable way to check if your ads are running. Thankfully, advertisers can check at any time if ads are eligible to show or not. If you are a client of ours and are ever uncertain, please feel free to ask us. We can tell you if they are eligible and to how many people your ads were shown in any given date range. 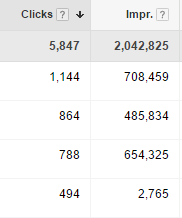 AdWords doesn’t lie about impression data. We can check any date range to see the amount of impressions and clicks for any ad or keyword. It’s a sure-fire way to know if people saw your ads on any given day. Within the AdWords interface, we can see which keywords and ads are eligible and which are not. When ads are not eligible to show it will tell us why. We can also see the quality score of keywords which is calculated based on expected click-through-rate, ad relevance, and landing page experience. Eligible: The keyword or ad is active and showing for searches. Campaign or Ad Group Paused: The ad group or campaign in which the keyword or ad is has been paused. We do this to focus budget on relevant and well-performing campaigns. Below First Page Bid Estimate: The keyword or ad is eligible, but the bid is too low to show on the first page. We will increase the bid if it makes strategic and budget-minded sense. Disapproved: The keyword or ad violates Google’s advertising policies. When we see this we either take action to resolve this status, or use alternate keywords and ads that fit within Google’s guidelines. Low Search Volume: The ads are not generally showing because the amount of search traffic for the keywords associated with it is too low. These are often very specific keywords that may still be valuable for the few searches they do receive. The Ad Preview and Diagnosis Tool lets us enter any search query, just as you would type it into Google, and shows a preview of a Google search results page for a specific term. If clients want to see how their ads look, we can send screenshots from this. If ads are not appearing, this tool goes into more depth than just the status and can help us identify what is causing an ad not to show. For example, there could be a negative keyword conflict that is keeping a keyword from generating ads. It helps direct us to the negative keyword in question so we can either remove it, or move it to a different ad group or campaign. So in short, there are plenty of reasons why you may not see your ads. But in general you should not search for them because it can skew your data just by seeing them, and cost you money if you click on them. If you run your own Google ads, it’s best to check if your ads are showing within the AdWords platform. If you’re a Workshop Digital client we’d be happy to share impression and click data, and results from the Ad Preview and Diagnosis tool whenever you’d like. We aim to be transparent in everything we do! Contact us to find out more about our paid search services!